Fruit-fornicating robots, drunken phonograph players, and rich people who shoot lasers out of their monocles. Welcome to the world of Penny Arcade, an insanely popular Web comic that skewers the video game industry with a healthy mix of satire, absurdity, and slapstick. Not content to merely play critics of the industry, writer Jerry Holkins and illustrator Mike Krahulik have unchained their own rabid bulldog of a game to literally embody the change they seek in the industry. As these caustic comedians of computer games proved in the Penny Arcade Adventures: On the Rain-Slick Precipice of Darkness, their creative efforts can also produce some entertaining games as well. In the newest installment called Penny Arcade Adventures: On the Rain-Slick Precipice of Darkness, Episode Two, you play as a customizable player who teams up with Penny Arcade protagonists Tycho and Gabe to track down an evil rampaging robot. As has become the hallmark of the series, your adventures involve doing battle with an assortment of enemies in RPG-style combat while hunting items and solving puzzles like those of an adventure game. Your travels this time take you to an insane asylum, the lair of a big-game hunter, the World’s Fair, and the Symposium on the Future of Man. Fans of the comic perhaps best appreciate Episode Two, but the humor is pretty universal. Gabe plays a murder-happy ruffian and Tycho plays a near-insane gun-totting intellectual. You are armed with a gardening hoe. You’ll find yourself encountering scientists fighting with mechanical monkeys, pithy comebacks by robots, and rich people just begging for a beat down. In this steam-punk like fantasy world, dark humor and bloodshed are par for the course. I find it’s moments when you recognize characters from the comic, like Tycho’s inventor niece Annarchy, and Charles the Mac-addicted “friend,” that you really geek out and appreciate the subtlety perks of the game. Admittedly, a game that features fornicating robots isn’t exactly high on the subtlety meter, and players new to the series may be turned off by a seemingly unending parade of bizarre and shocking characters. One of the biggest knocks on the series so far has been the combat system. While more approachable than many RPG systems, it’s shallow, tedious, and quickly becomes the most limited aspect of the game. You’re essentially limited to a standard attack, power attack (you unlock three power attacks per character over the course of the game) and the use of several items. There are side-characters that can be called upon (like Div the obsolete phonograph player, who will vomit on your enemies) and you perform defensive maneuvers by timing your blocks. 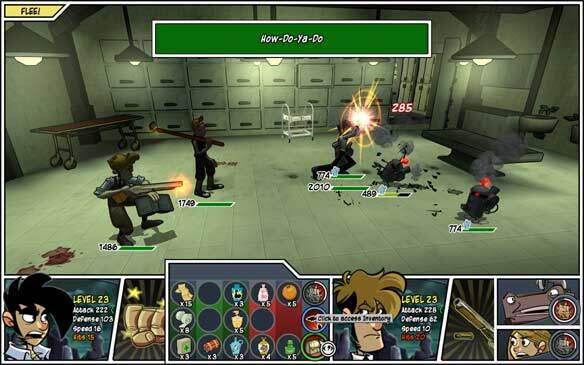 The developers sought to break up the typical formula of RPG combat by introducing real-time actions in combat, like button-smashing mini games to perform power-moves. But by the sixth hour, the humorously named attacks lose their mirth and the timing of the power-moves becomes a chore. The adventure aspect of the game is also pretty uninspired, with characters essentially tasking you with fetching certain items and there just happens to be an army of baddies between you and the item. This formula, while approachable, has grown stale and is disappointing considering the creative talents of those involved. Even given the eight to ten hour length of the game, the comedy, interesting characters, and offbeat puzzles weren’t enough to offset the boring combat/item fetching sequences. Penny Arcade Adventures: On the Rain-Slick Precipice of Darkness, Episode Two. I tested the game on a 2.4GHz MacBook Pro. Not surprisingly, the game ran beautifully while using the laptop’s Nvidia GeForce 9600M GT graphics card. When I switched to the laptop’s Nvidia GeForce 9400M video card, the game looked pretty good, aside from some detail loss around the edges. Due to the cartoonish animation, we found that even running the game on Normal graphic settings on a 2.1GHz MacBook didn’t dumb-down the visuals too much. Playgreenhouse.com hosts Episode 2’s stats, leaderboards, and awards received in game. The site is dedicated to building a community around independent game developers (like Hothead Games) with gamers (like you!). It’s pretty bare-bones at this point, but like the Penny Arcade site itself, has a dedicated forum and colorful forum crowd. Penny Arcade Adventures: On the Rain-Slick Precipice of Darkness, Episode Two is at its best when you see Krahulik’s signature art combine with weird characters, dark comedy, and a thoroughly deranged plot to create a unique world. Fans of the series will enjoy the quips and satires of gaming’s tropes, but newbies will likely be turned off by the lackluster combat system and sometimes-crass humor.